San Francisco: Like the love child of a Durango and a hatchback, the 2007 Dodge Caliber is surprisingly stylish, roomy and innovative for its price. It combines the practicality of a minivan with the efficiency of an economy car. The coolest feature - literally - in the 2007 Dodge Caliber is the Chill Zone, a little compartment by the glove box that keeps bottled drinks cold. Other neat features include a foldout stereo for tailgate parties, a 110-volt AC outlet and a holder for your iPod built into the armrest. When you think of an innovative car, you probably imagine something expensive. Innovation and price usually go hand in hand because the more you pay for a car, the more cool gadgets you expect it to have. Well, Dodge turned logic on its head when it created the 2007 Caliber. It's an extremely affordable car, with a base price slightly less than $13,500, but it's also one of the most innovative vehicles I've driven in a long time. It's a fantastic replacement for Dodge's ho-hum economy car, the Neon, which will no longer be sold after 2006. For starters, the Caliber has a style and body layout like no other car on the road, resulting in an eye-catching look and more usable space than other cars in this ultra-cheap class. From the outside, it looks like the Caliber is divided in half at the windshield. Everything in front of the windshield is styled like an SUV, and everything behind it looks like a European sports hatchback, resulting in a car that doesn't seem as dorky as most hatchbacks nor as portly as most SUVs. It also results in a surprisingly roomy interior. The front seats are perfectly comfortable, and the back seats leave a little more legroom and a lot more headroom than you'd expect to find in a subcompact car. Everything is laid out efficiently with lots of nooks and crannies for storing things. You'll find some cool innovations inside, too. One is a small compartment that keeps drinks cold while you drive. It's not a real refrigerator like you'd find on a hyper-expensive luxury car, but it will keep four 20-ounce bottles nice and chilly on a road trip. Best of all, it's not an expensive optional feature that you won't be able to afford. It comes at no charge on every Caliber that has air conditioning. Some other unusual features are related to the sound system. It comes with an iPod holder that flips out of the armrest, perfect for holding your MP3 player or cell phone for easy access. And if you opt for an upgraded stereo, it comes with foldout speakers designed for tailgating or having an impromptu party behind your car. There's even a 110-volt AC power outlet included. Pretty cool stuff. When it comes to driving, the Caliber really isn't anything special. It drives like an economy car, with OK acceleration, a relatively harsh ride and a mildly noisy cabin. It feels competent, but not much more. The $13,455 basic SE model comes with a 1.8-liter, four-cylinder engine and a five-speed manual transmission. A continuously variable transmission (CVT) is a $1,000 option, and it lacks air conditioning, power windows and power mirrors. If you want all those, it will cost about $1,500 more. If you want even more standard features, opt for the SXT model ($15,425). For better performance and more luxury, you can pick the R/T ($19,425), which has a 2.4-liter engine, the CVT and a long, long list of standard equipment. Overall, it's hard to argue with the Caliber's combination of style, practicality, innovation and affordability. It's the kind of car I think we'll see packing America's highways in a couple of years. What was tested? 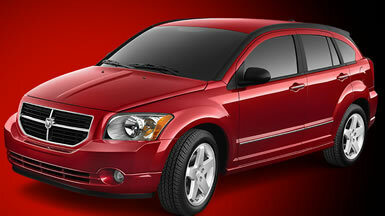 The 2007 Dodge Caliber R/T with a base price of $19,425. Options: Leather interior group ($1,045), cruise control ($250), sunroof ($750). Price as tested: $20,425. Why buy it? It offers real innovation and a unique style rarely found in cars this cheap. It combines the best features of a minivan and economy car into one stylish, efficient, family-friendly vehicle.